We all live and breathe culture. Culture is the invisible language that separates and unites people. Culture speaks to the inner parts of the human being, to her heart and feelings. For reaching people in meaningful way, what can be better than culture? Cultural Diplomacy has today become a fashionable idea and expression. What does it actually mean? The answers vary, depending on who you are asking. Why is one taking a cultural diplomatic measure and for whom? Can Cultural diplomacy be aligned with one’s nation branding? Cultural diplomacy can be an important part of a country’s public diplomacy and it can be an important part of a country’s international relations. Many researchers agree on that overlooking the understanding of others on cultural levels can result in costly mistakes, or it can simply undermine the breakthrough of any public diplomacy project. Cultural Diplomacy is traditionally something exercised by state representatives in international relations but today it involves more and more private sector and institutions. ifa laboratory promotes the new kind of cultural diplomacy based on value-based interaction. Cartoon creation as conflict prevention. A dialogue between teenagers in Bogota, Ciudad Bolivar and Brussels, Molenbeek through a cartoon magazine creation. The work is led by illustrators Xavier Löwenthal (BE) and Sindy Elefante (CO). The project is realised with the Ministry of Foreign Affairs of Colombia, through the embassy in Brussels. In 2016 ifa laboratory conceptualised a project in collaboration with the Embassy of the United Arab Emirates in Brussels. The wish from the embassy was to make local social positive impact. The project “Engaging Through Art and Enabling Communities” was created. 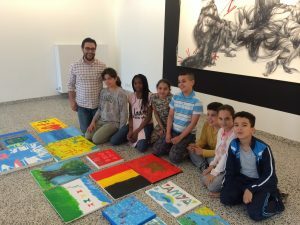 In the neighbourhood of the Marolles in Brussels painting and monotype workshops were offered to 10-12 year old children in a contemporary art gallery. 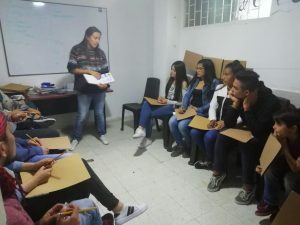 The objective was to open up exchange between very different and non communicating communities. Click here to see the visual PDF report.